Often called a Horny Toad or Horned Frog, the creature sitting atop this vessel is technically called a Texas Horned Lizard. It is cast in bronze through the lost wax process. A desert habitat is suggested through a cloisonné pattern of chestnut brown and grey transparent enamel of fine silver foil. 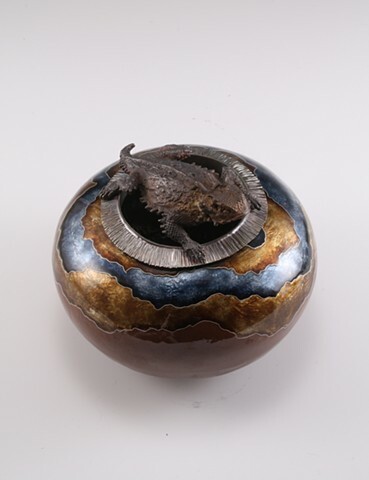 The image of the vessel here in this online portfolio is an example of the Horny Toad Vessel series. Each piece is hand-made by the artist & has its own distinctive features.